D-2 (D no Shokutaku 2 (Dの食卓2) in Japan) is the sequel to D and Enemy Zero, and was released for the Sega Dreamcast in 1999. There are no less than three different special editions of the game in Japan along with the standard release. 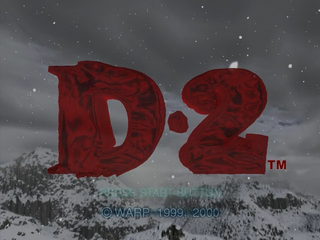 Warp originally started working on a D-2 as early as 1996, where it was targeted for release on Panasonic's M2 console - a console which never saw the light of day. This Dreamcast D-2 is a re-working of that game, with basic ideas and concepts brought forward, but with an entirely new game engine and assets. At one point, D2 was being developed for the Sega Saturn (having been hinted by Kenji Eno at Tokyo Game Show 1997 Autumn) before being moved to the Dreamcast. C.G. Supported by: Shirogumi Inc.
C.G. Supported by: D-Storm, Inc.
C.G. Supported by: DPS Japan K.K. C.G. Supported by: Q, Inc.